A unique and innovative formula for men`s skin care. Due to the multiplicity of the hormone testosterone, male skin secretes greater amounts of sebum giving it a shiny appearance with enlarged pores. In addition, men`s skin is 20% thicker than women`s skin and needs delicate and soothing treatment due to shaving, sweat and skin damages caused by sun, alcohol, fatigue and stress. 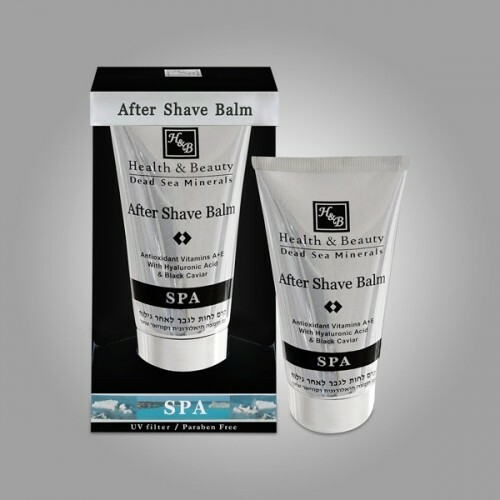 This After Shave Balm is light and non-oily. It contains natural Aloe Vera and Chamomile to soothe and help prevent irritation after shaving. Enriched with Vitamins A + E considered as the most active natural antioxidants. The balm is formulated with Green tea, Coconut oil and active Dead-Sea minerals for long-lasting moisture and freshness. It is enriched with Hyaluronic Acid and Black Caviar for significant improvement of skin elasticity. They also assist in preventing the appearance of fine lines and provide a young and fresh appearance. Contains UV filter. Suitable for all skin types.